Three lamps – Free Beers! – AGWB. Home › Uncategorized › Three lamps – Free Beers! Three lamps – Free Beers! Download the Three Lamps App for Apple or Android and keep up to date with what’s going on at Three Lamps Bar & Eatery as well as getting exclusive App only offers, specials and giveaways. Check the Freebies page for our weekly giveaways. Make sure you accept Push Notifications so the offers get to you! 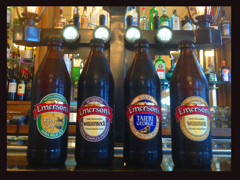 This week you can enjoy a free bottle of Emersons with any food purchase.